If your household is still suffering from post-holiday chaos, check out these 10 hacks from Aliexpress to help you finally get organized. Each product on this list meets high popularity and practicality standards at the unbeatable price of $5.00 or less. Free up some floor space by giving your mop and broom a home. Installation requires no tools. Just peel and stick for a tidier closet. You can also use it in your kitchen for your kitchen supplies. Keep your sponges at the ready by using the vertical space in your sink. Sponges tend to soak up germs by the drain. Keep them clean and out of the way with this sponge holder for less than a dollar. Designate a place for your washcloth with this unique solution. Simply stuff a corner of the cloth into the soft teeth to hang for the next use. Tip: Try mounting the holder on the inside of your cabinet door to keep it out of sight! What about the empty cabinet space above your plates? This cup hanger allows you to hang cups from the shelf above. Gain control of the dreaded spice cabinet. This rack is a great way to use that vertical space on the inside of your cabinet door. No more digging! By the way, you are going to get 4 pieces that can hold up to 5 jars of spices (each) for the price of 4$. Organize like a pro and contain your clutter. These 5 budget-friendly containers will help you get excited about cleaning with some fun and functional choices. These little bins are great for those miscellaneous items lying around the house. The bins are collapsible and easily stored away when not needed. Choose from a variety of prints (14 of them) for a touch of whimsy. This basket will hide your clutter while making your room look nicer and classier. Don’t underestimate the versatility of this little organizer. Desktop clutter and makeup mess are just the beginning of what this finishing box can contain. A built-in drawer makes this cosmetics container a unique option. Keep all your cosmetics in one place for an easier morning. 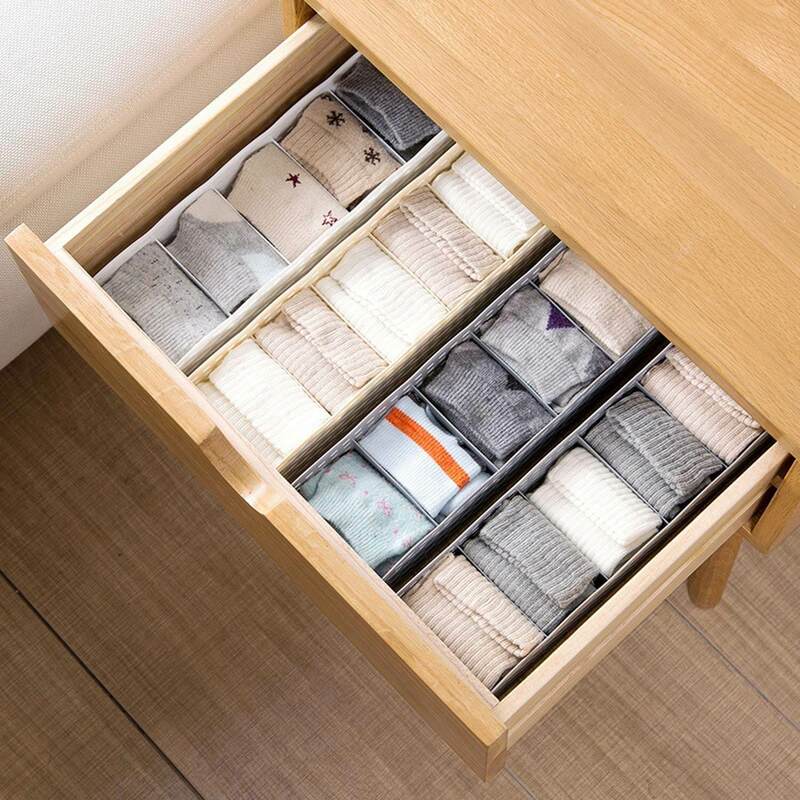 Bring peace to the chaos of the sock drawer for good with this sock organizer. The dividers will keep every pair neatly in its place. Remember, there’s no need to take on the clutter of your entire home at once. Set yourself up for success by starting as small as a sock drawer or a spice cabinet. Spend less than $5.00 on one of these products and see how it will transform your space. Don’t forget to look for more home improvement tips on our blog. Happy organizing! And as usual, don’t forget to check out our Facebook page and give us that follow so you won’t miss any new article!